I am really lucky to be the Outreach Officer in the chemistry department at the University of Birmingham. This means my days are really varied from writing reports so that charities will support us with grants to visiting schools or museums to run workshops with students or helping researchers share their research with non-scientists. It’s great that I can spend my whole time meeting such a wide variety of people and to be learning new things every day from exciting current research, to teaching styles and how to look at things from a new perspective. During all of my studies I got to live in different places, I moved from Cumbria to London to study Chemistry at Imperial College. I then spent a year living in Switzerland working for Firmenich, a company that specialises in fragrance chemistry. I then moved to Coventry to do my PhD at the University of Warwick and now Birmingham so I have truly been converted to the Midlands! When I am not working I like baking, travelling and telling chemistry jokes that are so bad they’re good. 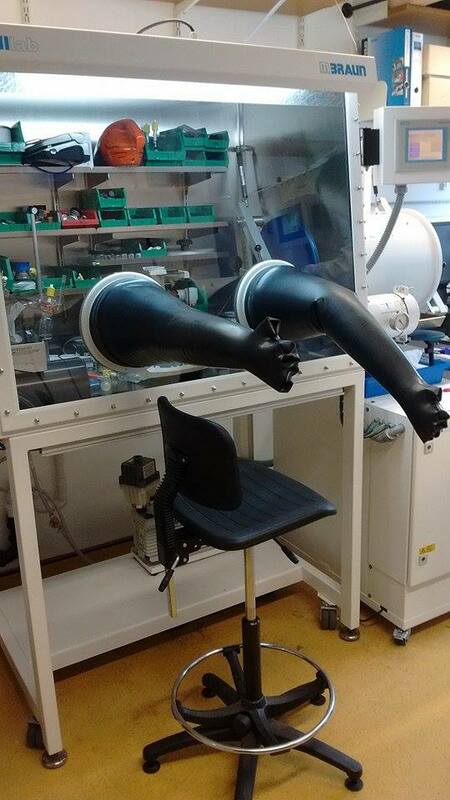 The glovebox I used during my PhD. My PhD involved studying Co-ordination chemistry of calixarenes with Dr Chaplin. Calixarenes are large molecules that often contain around 100 carbon atoms and have molecular weights of over 1,000 Da, they are shaped like cones so smaller molecules can get trapped inside them which makes them easier to study. What I really liked about this work was the variation. Sometimes I got to do a lot of synthetic organic chemistry where I was using 250 g of a reagent and mixing things together and other times I was carefully weighing out 1 mg (0.001g!) of material in a glovebox (a box where we use an inert gas like argon or nitrogen because our materials react with air). A photon checks into a hotel and is asked if he needs any help with his luggage. He says, “No, I’m travelling light”.